Christmas Day came late to the Timmins household that year. Mr Timmins was working away overseas until Christmas Eve and nobody felt “Christmassy” until they were all together. Besides, all the Christmas decorations were hidden away in the loft amongst spiders and other things. Mrs Timmins didn’t fancy tackling that lot! Anyway. Everything else was done. All the presents bought and wrapped, all the food prepared, Christmas cards on display all around the house. Even Pepe the cat had found himself a bit of tinsel for his collar! “Never you mind. Now fetch your little sister – quickly. There’s a Taxi coming down the road”. Sure enough, Mr Timmins was in the Taxi, together with a huge stack of colourful parcels. 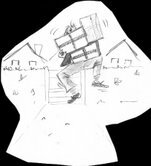 Peter and his mum giggled as they peered through the letterbox and watched him juggle and struggle to balance the parcels. All they could see was one hand, two shuffling feet and one eye peering over the edge. They really did ought to help him but… it was funnier watching! Mr Timmins eventually made the front door. Slowly he bent to one side, stuck out a finger on his visible hand and whilst squinting his eye, took aim for the doorbell. At once the door flew open and he was greeted by a huge “Merry Christmas”. All he could say was “Heeellllp!”. “Daddy, you’ve got to get the tree made and the decorations hung up”. “Can’t I just have a little dr…” started Mr Timmins the cup only inches away from his lips. How could he resist, the look of wonder in Peters eyes was too much to bear, and the tugging at his shirt meant he couldn’t get his tea to his lips anyway! And Mrs Timmins wouldn’t let him drink either. Flippin’ Mistletoe! So, armed with a torch and tissues ( it was very dusty in the loft) Mr Timmins ventured to do battle with spiders. Peter and Mum waited at the bottom of the ladder to take the boxes. Mr Timmins appeared at the trap door with the torch shining under his chin. “whooooaaarrgghhh I’m a ghost” said Mr Timmins. Mum and Peter looked at each other with folded arms and shrugged their shoulders. After all, he does the same thing every year…..
One by one the boxes are lowered gingerly to the ground. From there they are delivered to the living room where most of the decorations will be displayed. Peter watched on eagerly as his parents set to work. Mr Timmins was in charge of, Opening boxes, Fetching, Cleaning off dust, Mending tree lights, Climbing ladders, Fastening pins, Sticking tape, Falling off ladders, Mending tree lights (again) and Hitting his thumb with the hammer. Mrs Timings was in charge of “Decoration Design and Planning”. In other words, telling Mr Timmins where to hang things! As usual, the house started to look lovely and magical. Peter had eyes like saucers as his home began to look like something out of a Christmas storybook. He was so happy that all was nearly complete now. Even Dad was giggling and chasing mummy around holding a twig above his head – mad he thought. Eventually the Christmas Tree began to take shape. “Only Mummy’s can do Christmas trees” said Mrs Timmins. Mummy nodded in the direction of the, by now heavily snoring, body of Mr Timmins slumped in the armchair. They both laughed quietly so as not to wake him. All the baubles, toys, sweets and lights were now on the tree, including the special new star, which Mrs Timmins bought earlier to go on the top. Peter picked up a small box that remained unopened. “What’s this mum?” he asked. Even though the bauble indeed looked very tatty and dull, Peter couldn’t help feeling that this little glass ball was the most ‘Christmassy’ thing he’d ever seen. It was as if loads and loads of Christmases had been soaked up by the bauble over the years. 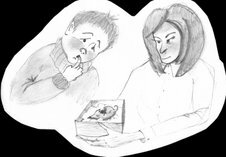 For the first time that day, he felt a little sad when his mum gently replaced the lid on the little box. “Right young man its bath and bed for you” ordered Mrs Timmins. How those words sounded so dreadful to Peter. “Bath and bed”. Like “eat your peas” and “give Aunt Mabel a kiss” thought Peter. “Well at least it won’t be long before its Christmas Morning,” he said to himself. Tossing and turning. That’s all Peter could do. It just wasn’t ‘Christmassy’. “Something isn’t right,” he thought to himself. But what could it be? His Dad was safely back home which was brilliant so it couldn’t be that. The house was decorated to perfection so it couldn’t be that. Everyone knows that Santa’s reliable so it couldn’t be that. And Aunt Mable wasn’t visiting until Boxing Day so it couldn’t be that either. Then he realised what was troubling him. The broken bauble! “Of course! That’s it!” exclaimed Peter to himself. “I’ve got to save Christmas!” he thought, sitting bolt upright in his bed. Checking his clock, he was sure that Mum and Dad were in bed by now. Very gently and very quietly, Peter slipped on his robe and made his way down stairs. “Not safe to touch” came his mum’s voice as he remembered what she said. Taking the key from the hook in the kitchen, Peter opened the connecting door to the garage. “Right, if we’re going to do this, we’ve got to prepare ourselves”, said Peter to Pepe who clearly wanted to help. “Safety first” said Peter as he found his mums special gardening gloves. Slipping them on to his tiny hands. They looked like gauntlets! “Can’t be too careful,” he said as he climbed into a pair of fisherman’s wellingtons. “Nothing can hurt me now!” he said as he dropped his fathers motorcycle crash helmet over his head, two eyes peering out of the narrow slit in the helmet. Pepe looked on quizzically before strolling to his dinner plate, hoping this strange new friend would fill it for him! Peter stepped into the hallway, shuffling his feet so they stayed in the boots, hands pressed to the sides of the helmet to stop it rattling on his head, and made his way to the lounge. How wonderful the room looked. The tree lights were reflecting off all the tinsel in the room, sending out showers and sparks of colour. “Phew. Glad they remembered” said Peter, spying the mince pie and glass of sherry next to the fireside. He made his way to the tree where, with relief, he found the boxes, which held the decorations. “Please be still here” whispered Peter. At last he found what he was looking for. The small box which held the sad bauble! Very gently and very carefully, he opened the box. Making sure Pepe wasn’t around, he tipped the bauble onto his gloved hand. “I couldn’t let you miss having this last Christmas,” he said to the bauble. “ Daddy’s home and this is little Mary’s first Christmas so you must share it with us”. And with that, Peter carefully placed the Bauble on a branch, high up the tree, near the back, so only he would know. And where no harm can be done. “Now Christmas can REALLY start” declared Peter feeling very proud of himself. The Timmins family were all now resting and the moon cast its gentle glow over the snow-covered rooftops of the town. All was still and silent but for the soft sound of footsteps crunching through snow. And the little grunt of exertion such as one would make climbing down a chimney. And a little thud as a well-padded bottom hits the floor. “ I’m getting too old for this” whispered Santa as he surveyed the Timmins lounge. “Stop your grumbling and open your sack” came a cheerful but old voice from behind the tree. “ He he he” laughed the Bauble. For indeed his name was Jacob, and he and Santa had known each other for many years. “ Well well well” smiled Santa, as he peered around the tree to see his old friend. Very carefully he picked the bauble from the tree and nestled it in his hands. He could see that all was not well with Jacob. “Indeed I have been lost to the world Nicholas” spoke Jacob with a heavy voice. “ So many years have passed since the First Christmas when I shone so brightly over Bethlehem that I have since, alas, faded away. However tonight, I have witnessed the true meaning of Christmas once again. For the last time, I can celebrate Christmas with you my friend, because of the belief and love of one small boy. In him, the spirit of Christmas lives on! ”. Santa looked at his friend and realised that this was indeed the last Christmas Jacob would see. “ Its time we parted Jacob” said Santa. “I can hear a paddling of feet above from one of the bedrooms. So its goodbye from me. But not before I give you this special gift”. Just in time to witness a wonderful thing. The bauble that Peter placed on the tree stirred. It began to sparkle and gleam all colours of the rainbow before whizzing around the room, twice around Peter’s head and then shot off up the chimney! Peter ran to the window and threw open the curtains. There he could see the bauble flying high, higher into the night sky, finally to find its place amongst the other stars. “Happy Christmas Bauble” whispered Peter as he waved goodbye to the Star.